This week we’ll be taking a break from Michigan Whiskey for St. Patrick’s Day! I normally dog on Jameson a bit so I thought I’d try one of their higher level, different whiskey’s. Even better they’re using a process with this Caskmates that’s very similar to what my favorite bourbon New Holland Beer Barrel Bourbon is doing by finishing this whiskey in beer barrels. 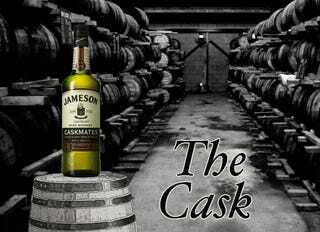 So Jameson is using a local brewery’s Stout barrels. It’s awesome that distilleries are taking these chances, I love that they’re doing it. Unfortunately I’m not a huge fan of the stout flavor blending with the Irish Whiskey flavor. It appears on this one it’s really about a personal taste because a buddy of mine tells me he loves it. The price of this Speciality Irish Whiskey actually seems pretty fair. I have no complaints about a special edition Whiskey from a successful mass producer just a hair over 30. So there it is, I say this one was a bit unfair. I just thought it was....weird. These 2 flavors together didn’t work for me. Like I said, I told my buddy I wasn’t into it and he was shocked. This just continues to prove that whiskey is a personal taste thing. While I’ll sit here and say it’s terrible, someone will go in the comments and tell me it’s great. I hope you all know these are personal reviews and they reflect what I THINK about the given whiskey. I have to say I’m damn happy I still had some Donegal on hand to switch over to so I could really enjoy my St. Patrick’s day!! I hope you all had a great St. Patrick’s day and you have a great weekend!